Mark 9:2-9 Six days later, Jesus took with him Peter and James and John, and led them up a high mountain apart, by themselves. And he was transfigured before them, 3 and his clothes became dazzling white, such as no one on earth could bleach them. 4 And there appeared to them Elijah with Moses, who were talking with Jesus. 5 Then Peter said to Jesus, “Rabbi, it is good for us to be here; let us make three dwellings, one for you, one for Moses, and one for Elijah.” 6 He did not know what to say, for they were terrified. 7 Then a cloud overshadowed them, and from the cloud there came a voice, “This is my Son, the Beloved; listen to him!” 8 Suddenly when they looked around, they saw no one with them any more, but only Jesus. 9 As they were coming down the mountain, he ordered them to tell no one about what they had seen, until after the Son of Man had risen from the dead. Romans 12:2 I appeal to you therefore, brothers and sisters, by the mercies of God, to present your bodies as a living sacrifice, holy and acceptable to God, which is your spiritual worship. 2 Do not be conformed to this world, but be transformed by the renewing of your minds, so that you may discern what is the will of God—what is good and acceptable and perfect. Beauty is thorny. We often suspect that beauty is contrived or exploited for gain. I’ve met many people who are suspicious of the aesthetics of beauty because they’re troubled about who sets the definitions and principles of what is beautiful. Here’s what I suggest for today. Let’s let the Transfiguration guide us. The Transfiguration is a dazzling, terrifying moment that surprises the disciples. Peter, James, and John are thrown off-balance to the point that Peter wings out an absurd building plan to sustain the moment. But it seems that it’s not about sustaining the dazzling moment of beauty. It seems that the dazzling moment of beauty is about sustaining them. Here’s one such moment. I was talking with a friend early last week about this idea of God’s beauty surprising us. He was one week into teaching a two-week technical class that includes electrical safety and the like out at Denver Women’s Correctional Facility. He told me about a class moment during which a woman’s attention was drawn to a book underneath her desk rather than on the class discussion. Stopping the class, he asked the woman what she was reading. Turns out it was the Bible. She had been to a worship service the evening before and wanted to keep going. My friend’s exact words to describe that moment were, “Beauty tore into life to dominate the day.” Poor class behavior notwithstanding, this woman’s Jesus moment would not be thwarted. My friend saw a glimpse of God’s sustaining beauty in that moment. Here’s another one. Last Sunday, our youngest choir called the Cherub Choir sang a song called, “God has made me wonderful.” What made it beautiful was not harmonious brilliance. The beauty was their exuberance in singing the message and the fact that they were singing the message at all. I would hasten to bet that the thought bubbles that pop up over your heads during the week about yourself and other people don’t exactly echo “God has made me wonderful.” Think about what does pop up in those thought bubbles in the grocery aisle, in the hallways, and in traffic. Now is probably not the best time for the turn-to-your-neighbor and have a conversation on that topic. When those kids were singing last week, it was a glimpse of the beauty of God. So much so that the beauty of it intruded my mind several times during the week. Surprising glimpses of God’s beauty are pure gift that transfigure us, sustaining us in dark times. This is not to be confused with putting on rose-colored glasses to avoid bad news or the pain of trauma. This is about God’s beauty that sustains us through the pain. There is a centuries old Christian practice of iconography that trains the mind’s eye to see the beauty of God revealed in the world. Martin Luther, from whom Lutheran Christians are so named, was no iconoclast. He did not support or encourage the destruction of religious images and icons the way other 16th century reformers did. Icons were simply one more way to catch glimpses of God’s beauty in the world. They are paintings that often feature Christ or the infant Jesus and his mother Mary or other ancestors of the faith. They’re painted with precious metals and have many meanings painted into them by way of color, clothes, hand positions, halos, and more. I have a couple small icons in my home. One is of Mary and the baby Jesus. This icon hangs next to a crucifix so that I can regularly reflect on the mess and the beauty of the incarnation of God from a mother’s body in tension with the suffering of God on a cross. Icons engage the senses and imagination preparing the faithful to see the image of God in the world. The in-breaking of God’s image, God’s beauty that surprises and transfigures us. 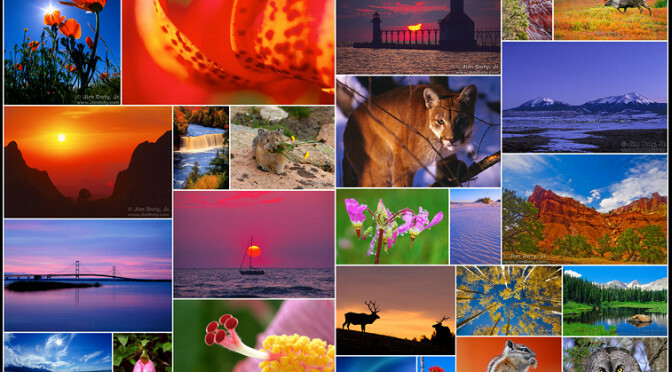 Pictures that flood social media very often include sunsets, sunrises, mountains, trees, flowers, animals, and birds. Christians believe that nature in all its glory reveals the glory of God. Referring to nature as creation reveals it as another icon of sorts – revealing God’s provision of food and water as well as the beauty of God that surprises, inspires, terrifies, and ultimately sustains. I believe that the beauty of God sustains us, my friends. But I also believe that sharing our glimpses of the beauty of God sustains other people especially when we see it in them. At a time when despair nips at our own heels and overwhelms people we love, we offer by faith the glimpses of God’s beauty that we experience by grace. Whether through prison Bible reading, a song by young children, or the icon of creation, God breaks through with glimpses of beauty so compelling, so dazzling, that we cannot look away. Not only can we not look away, but we are sustained through bad news and trauma. God has made you wonderful. You are living icons through whom God’s beauty is revealed and sustains. Be at peace. The light of Christ shines in you. Thanks be to God. And Amen. Anthony Ugolnik. The Illuminating Icon. (Grand Rapids, MI: Wm. B. Eerdman’s Publishing Co., 1989), 59. This phrase is part of the worship liturgy called the Dismissal during this Sundays after Epiphany. Now about eight days after these sayings Jesus took with him Peter and John and James, and went up on the mountain to pray. 29 And while he was praying, the appearance of his face changed, and his clothes became dazzling white. 30 Suddenly they saw two men, Moses and Elijah, talking to him. 31 They appeared in glory and were speaking of his departure, which he was about to accomplish at Jerusalem. 32 Now Peter and his companions were weighed down with sleep; but since they had stayed awake, they saw his glory and the two men who stood with him. 33 Just as they were leaving him, Peter said to Jesus, “Master, it is good for us to be here; let us make three dwellings, one for you, one for Moses, and one for Elijah”– not knowing what he said. 34 While he was saying this, a cloud came and overshadowed them; and they were terrified as they entered the cloud. 35 Then from the cloud came a voice that said, “This is my Son, my Chosen; listen to him!” 36 When the voice had spoken, Jesus was found alone. And they kept silent and in those days told no one any of the things they had seen. 37 On the next day, when they had come down from the mountain, a great crowd met him. 38 Just then a man from the crowd shouted, “Teacher, I beg you to look at my son; he is my only child. 39 Suddenly a spirit seizes him, and all at once he shrieks. It convulses him until he foams at the mouth; it mauls him and will scarcely leave him. 40 I begged your disciples to cast it out, but they could not.” 41 Jesus answered, “You faithless and perverse generation, how much longer must I be with you and bear with you? Bring your son here.” 42 While he was coming, the demon dashed him to the ground in convulsions. But Jesus rebuked the unclean spirit, healed the boy, and gave him back to his father. 43 And all were astounded at the greatness of God. We tell time in all kinds of ways. Some of us take that slightly sideways-downward glance at our wrists to check the watch that has been in the family for years – perhaps to see how much longer the preacher might go (while you think the preacher doesn’t notice). Others of us whip out the latest cell-phone and touch a screen for the time to light up along with text messages clamoring for a response. For others of us, time registers more physically – our eyes open, it’s time to get up; our stomachs growl, it’s time to eat. Regardless of how we do it, we are creatures that tell time and respond to it. We are also creatures who know how our time is to be spent. Time is prioritized and reorganized, lost and found. It is so a part of who we are and how we move through the world that there is very little challenging our assumptions about it. And this is why I love church-time, otherwise known as liturgical time. Churchy, liturgical time comes up against and pushes through the way we spend our days – pointing us in a different direction than the one that ordinarily grabs our focus. The church year begins in advent with the paradox of apocalyptic prophecy and soft candlelight as we wait for the Christmas birth and revel in the 12 days post-partum. Epiphany comes in on a star as the Christ-child is revealed to the magi and then Sunday after Sunday we bathe in Epiphany’s light, light and more light until we arrive here, this day, this Transfiguration-of-our-Lord day. This day when the light becomes so bright that time bends around it, collapsing in on itself and bringing Moses, Elijah, and Jesus together on the mountaintop in a wild, Judeo-Christian Hall of Fame line-up. This time-bending light show bends Peter’s brain. He tries to think of the appropriate response, comes up with one, puts it out there and gets shut down. His faithful exuberance doesn’t get him very far. In fact he is silenced for the rest of the story. Silenced like the chastised, mid-wave, Mile High super-fans of Peyton Manning. Because what else can be meant by God’s emphatic command to, “Listen to Him,” other than a resounding, “Be Quiet!” Although most likely the message here is stronger, something more a bit more emphatic than a blue and orange arm-flapping gesture! This time-bending light show bends Peter’s brain – and perhaps in a similar way bends our minds as we are confronted by this text. What was he, and what are we, to make of this shiny Jesus and his shiny friends? The light show and the big three of Moses, Elijah and Jesus seem to say something about the Law and the Prophets and Jesus being the fulfillment of both of them. They connect Jesus, and therefore us, through God’s work in the world before this moment and into the moment of now. But if we simply stay in the time-bending moment on the mountaintop, we risk being disconnected from the point. My Uncle Larry came out from Massachusetts for my ordination. We talked a lot about a lot things, including my new call here at Augustana. We had time for one more chat over a cup of coffee before he left Tuesday morning. My uncle is wonderful at delivering meaningful messages. And as he was encouraging me about my work here he remembered hearing President Lyndon Johnson once say, “You aren’t learning anything when you’re talking.” Oh, sure, we could have fun challenging the statement, but in general there is some truth here. If I want to increase the odds of learning about who you are and what you are about then some silence on my part would be a good place to start. Peter could have used this lesson from my Uncle Larry before filling the air with this reaction and being silenced by God. But he gets a lesson nonetheless. This one is from Jesus. God’s command to silence allows Peter to look and listen in a new way without being burdened by the content of his response to the time-bending on the mountaintop that bends his mind along with it. After all, he is not left behind on the mountaintop in all of its dazzle and terror. What the disciples don’t get to see at this point in the story is how Jesus does for us, for all of us, what he did for the boy with the demon. This coming week, we’ll get together again on Ash Wednesday which drops us into six weeks of Lent reorienting us much the same way that the disciples were reoriented coming off of that mountain. More churchy, time-keeping that comes up against and pushes through the way we spend our days – pointing us in a different direction than the one that ordinarily grabs our focus. This past Wednesday, Pastor John and Malise de Bree, our Senior Ministry Evangelist, guided us through the funeral and interment of Bob Safe, a long-time friend and member of Augustana – a poignant moment of remembering his life and commending him to God, a time-bending moment where time stands still as we witness his ashes being placed into the ground right in front of us, just outside of this sanctuary, on the breath of our prayers and under the weight of God’s promise. We stood together, forming a circle alongside his wife and children who miss him the most. We stood there with the stunning bronze cross completing the circle on its north end and the burnished statue of Jesus in the middle of our circle looking at the cross. And as we stood in vigil, time collapsed in on itself. Time collapses because this is where the shiny Jesus and the cross meet in the fullness of the story – the dazzle of Jesus on the mountaintop shines it light toward the darkness of another hilltop where the truth of death is simultaneously revealed and overcome. To stay in the dazzle of the mountaintop until the resurrection glory of Easter is tempting but doing so robs us of the fullness of Christ’s work in us and for us; Christ’s work in Bob Safe and for Bob Safe; and Christ’s work in you and for you. So, today we dance in the dazzle as it illuminates the cross. Today Christ’s shining light illuminates his promise in you and for you.